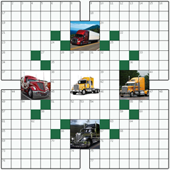 Free online Crossword puzzle №5: TRUCKS. 21. "The Wreck of the Mary ——," 1959 film"
49. "—— Aces" of radio fame"
57. "Co-star of "Rocky III"
77. Clicker that might be used on a trawler?